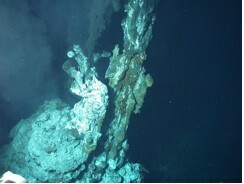 The black smoker vent, Sully, located approximately 2200 m below the sea surface, within the Main Endeavour vent field on the Juan de Fuca Ridge (in the NE Pacific Ocean). Shown here is the hydrophone system used (in 2004) to record the sounds of the smoker vent. The masses of white and pink are tubeworms that live in clumped colonies around the vents. Image credit: Tim Crone, www.fluidcontinuity.org/research/ventsounds/. Hydrothermal vents are analogous to hot springs on land. They are usually found in water between 2,000 and 4,000 m deep; however, shallow water vents have been observed off the coast of New Zealand, Greece, Italy, Papua New Guinea, and the Azores archipelago. The vents are formed when cold (2° C; 35.6° F) seawater seeps into the sea floor, picks up heat and minerals, and then rises up and out of the seafloor, back into the ocean. As the vent water bursts into the ocean, its temperature is greater than 350°C (662°F). The hottest and most vigorous of the vents are black smokers, named as such for the black plumes they produce. When the scalding hot fluid they release hits the icy cold seawater, minerals in the fluid precipitate out (form into particles), creating a plume that looks just like dark, billowing smoke. A well-studied black smoker vent (P-vent- named after the transect marker “P” that was placed there) located just east of the primary eruptive fissure within the Axial Summit Trough (AST) of the East Pacific Rise (EPR), a fast spreading Mid-Ocean Ridge. Photo courtesy Vicki Ferrini and Marv Lilley, Ridge 2000 MediaBank gallery (media.marine-geo.org/image/p-vent-black-smoker-epr-2004) and WHOI:NDSF (www.whoi.edu/ndsf). Although it was originally thought that these smoker vents were silent, research has shown that these vents, in fact, generate sound. The vents produce broadband acoustic signals at frequencies of 5-15 Hz with power levels approximately 10-30 dB above the ambient noise level. The vents also produce narrowband tones from 10-250 Hz, at power levels approximately 10-20 dB above the broadband signals. Each vent has a unique acoustic signature and scientists have theorized that this is most likely due to differences in the vent’s physical structures. Roach, John. 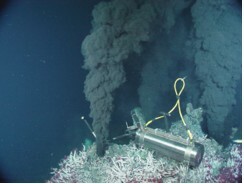 2007, Deep-Sea “Smoker” Vent’s Rumble Reveals Ocean Clues.” National Geographic News. Voyage of the Deep, Hydrothermal Vents. WHOI- Dive and Discover, Hydrothermal Vents. Hydrothermal Plume Studies, (n.d.). NOAA Vents Program. Retrieved from https://www.pmel.noaa.gov/eoi/plumestudies.html.